Jean Patou Sublime perfume was created as a vision of a bright and radiant woman. Jean Patou Sublime is a delicate, enveloping chypre floral perfume that adorns the skin like an exquisite piece of jewelery. Jean Patou Sublime has a caressing and captivating presence, just like a woman you cannot take your eyes off, it is the messenger of a true 'joie de vivre', of an irresistible and ravenous desire for beauty and harmony. Jean Patou Sublime perfume feels like it is between silk and velvet on the skin. Jean Patou Sublime perfume has a semi-oriental harmony of ylang-ylang, orange blossom and vanilla, with bright and brilliantly sensual top notes of Bergamot, Mandarin, Coriander and Green Note, combined with Rose, Jasmine, Ylang-Ylang and Orange Blossom and luxurious Sandal, Vanilla, Cedar and Civet. 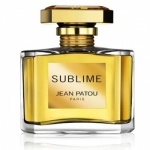 SUBLIME is a radiant floral bouquet encased in the signature JEAN PATOU bottle. It is pure olfactory bliss and a true celebration of the intense femininity and cool sensuality of the JEAN PATOU woman.